Relic Raiders Video Slot Guide & Review - Casino Answers! 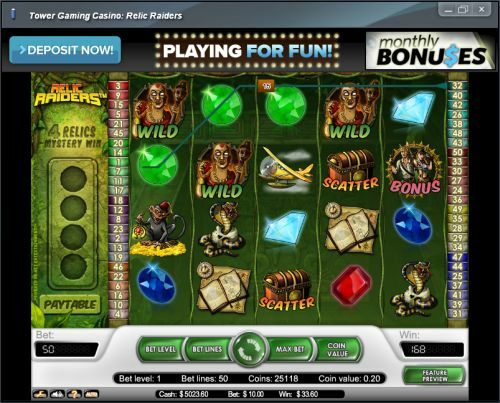 Relic Raiders is a 5-reel, 4-row, 50-line video slot developed by Net Entertainment, featuring a wild symbol, scatter wins, multipliers, a free spins feature and a bonus game. You can play the Relic Raiders video slot at Bovada. Coin values on the Relic Raiders slot machine are $0.01, $0.02, $0.05, $0.10 and $0.20. You can select from 1-50 paylines at 1-4 coins (or “Bet Levels”) per line. Relic Raiders is a penny slot, you can bet as little as one cent on a spin up to the maximum total bet of $40 per spin. For the most part, Relic Raiders is ideal for casual slots players, but high rollers should be fine with it as well. You can skill stop the reels by hitting the Spin button a second time in mid-spin. To play the Relic Raiders slot game, select your bet and hit the Spin button or to play all 40 lines at the highest Bet Level, you can press the “Bet Max” button. The highest paying symbol on the Relic Raiders online slot game is the Voodoo Man symbol (who strangely resembles Mola Ram from Temple of Doom). If you hit 5 Voodoo Man symbols, you will win the 10,000 coin top jackpot on Relic Raiders. The Voodoo Man symbol is wild and will substitute for all symbols except scatter and bonus symbols. Relic Raiders’ scatter symbol is the Treasure Chest symbol. 3, 4 or 5 Scattered Chests will pay out 10X, 50X or 200X your total bet. You will also trigger the free spins feature. You must click on one of the Scattered Chest symbols to reveal your free spins and multiplier. By hitting two more scatter symbols during the free spins feature, you will win additional free spins or a multiplier. You can win up to a 5X multiplier. Find your treasure on the Relic Raiders slot game when you play at Bovada! If you hit 3 Relic Raider bonus symbols from left to right on an active payline, you will trigger the Relic Raiders bonus game. You will get to choose a location from a map (reminiscent of the map scenes out of the Indiana Jones movies) between Tikal (Guatemala), Tintagel (England), Luxor Temple (Egypt) and Angkor Wat (Cambodia). You will have to break urns to win prizes, but if you break open the wrong one, a spider will come out and the bonus game will end. After the bonus game ends, the Relic from your location will be added to your collection. They will be saved for 36 hours from your last spin. Once you have collected the Relics from all four locations, you will win a mystery prize. Winning combinations and payouts are made according to the Paytable. Payline wins are multiplied by the bet per line. Wild symbol substitutes for all symbols except scatters and bonus symbols. Scatter wins are multiplied by the total bet. Scatter wins are paid independent of paylines selected. Scatter, Free spin, and bonus wins are added to payline wins. Only the highest win per active payline paid. Wins pay if in succession from leftmost to right, except scatter symbols. Simultaneous wins on different paylines are added. Relic Raiders has an autoplay mode that can be opened up by hitting the “Auto” button. You can play 10, 25, 50, 75, 100, 250, 500, 750 or 1000 autoplay spins at a time. In the advanced settings, you can set Relic Raiders autoplay mode to stop on any win, if free spins is triggered, if the jackpot is won, if a single win exceeds (any amount you input) and if cash increases/decreases by (any amount you input). You can stop the autoplay mode at anytime on the Relic Raiders online slot. Relic Raiders is a fun video slot, especially if you’re a fan of the Indiana Jones series. Even if not, you have a free spins feature, a bonus game and a great top payout. Aside from the slot’s features, the game looks and sounds great, which is always a plus when you’re playing a video slot. You can play the Relic Raiders video slot when you sign up and make a deposit at Bovada! Can players based in the USA play the Relic Raiders video slot for real money? American players are not able to play at Net Ent online casinos for real money at this time. However, you can play another Indiana Jones inspired video slot called Hidden Riches at Bovada. Where can I find a free Flash game of the Relic Raiders online slot? 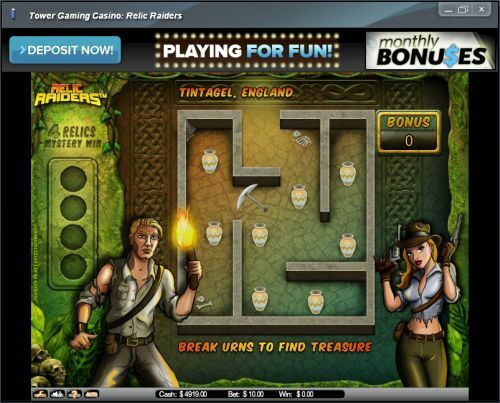 You can play a Relic Raiders Flash game right here on Casino Answers! There is no signup required. If you experience any issues with the Flash game, make sure you have the latest version of Adobe Flash Player installed on your computer.